14 Mar 2019 - Seaside East Civic Campus meeting - City of Seaside, Studio Gang, Fred Watson, etc. 31 Jan 2019 - $10.3M in additional state funding secured for FORTAG via grant awarded to TAMC by the California Transportation Commission. Grant covers Canyon Del Rey segments from Fremont to Carlton, and a connection up Carlton into Seaside along Plumas. Total funding now at $30.8M. 11 Oct 2017 - FORTAG presentation to MPRPD Board of Directors - Scott Waltz, Fred Watson. The board approved Resolution 2017-10 supporting FORTAG in various aspects, including an undercrossing of Gen. Jim Moore Blvd in so far as this relates to FORTAG alignments through MPRPD properties either side of GJMB. 18 May 2017 - Nationwide "Trail of the Month" article by Rails-to-Trails Conservancy highlights Monterey Bay's Coastal Rec Trail and FORTAG. 16 Nov 2016 - Public meeting for Fort Ord Oak Woodland Conservation Area (FORA, Seaside, & County) - Scott Waltz, Fred, Watson, etc. 28 Apr 2016 - TAMC Trails PAC meeting - Scott Waltz, Fred Watson, et al. 23 Mar 2016 - TAMC Board approval (unanimous). FORTAG remains at $20M in a motion to amend the list approved in February. 24 Feb 2016 - TAMC Board approval. FORTAG included at $20M on final list of regional projects to be funded by TAMC's transportation tax measure going to county voters in November 2016. 27 Jan 2016 - TAMC Board Meeting. Presentation by EMC Research on polling results relating to the TAMC Transportation Investment Plan measure for the Nov 2016 ballot. Bike safety emphasized. 17 Dec 2015 - FORTAG in the media. Article in Monterey County Weekly. 8 Dec 2015 - Marina City Council. Study session on Marina Heights. 2 Dec 2015 - TAMC Board Meeting. Item relating to Transportation Investment Measure Expenditure Plan. Motion unanimously passed to authorize release of "early draft" list of $600M worth of projectsto be placed on Nov'16 ballot. 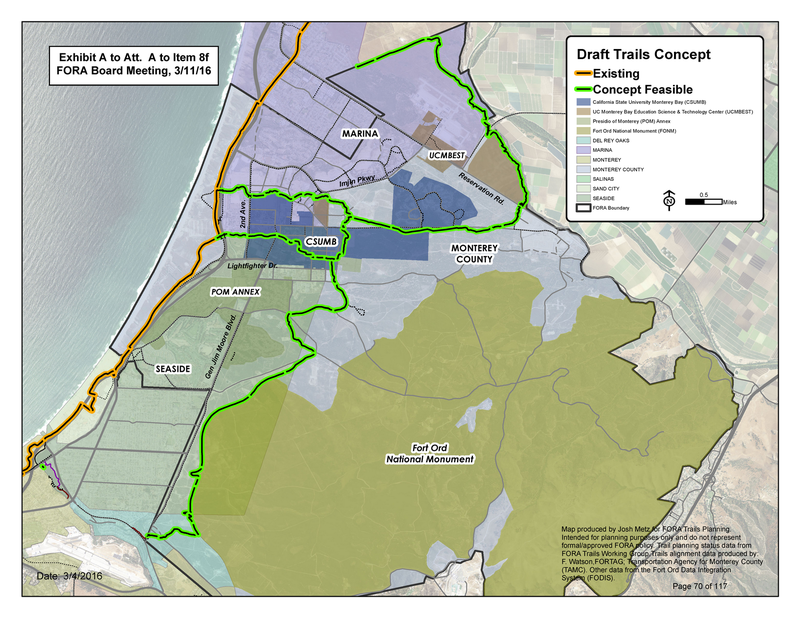 FORTAG included in the early draft list under a $25M item entitled "Recreational Trails, including Fort Ord Rec Trail". 18 Sep 2015 - TAMC Trail PAC meeting - Scott Waltz, Fred Watson, et al. 26 Aug 2015 - FORTAG presentation to TAMC Board - Scott Waltz, Fred Watson, et al. (exact wording pending receipt of meeting minutes). TAMC's "Highlights" from the meeting - "Outpouring of support for FORTAG"
23 June 2015 - CSUMB Campus Master Plan Sustainability Committee - Scott Waltz et al. 19 June 2015 - TAMC Trail PAC meeting - Scott Waltz, et al. 11 Jun 2015 - CSUMB Old Parade Ground walk-through - Laura Lee Lienk, Chris Placco, Scott Waltz, et al. 18 Mar 2015 - Public meeting - County's FORHA Trail Master Plan. FORTAG shown on county's draft trail master plan map/poster at meeting. 20 Nov 2014 - Gail Morton, Fred Watson - Public presentations to Marina City Council & Planning Commission. Council adopted motion to "Support the concept substantially as presented by [the FORTAG Northern Loop map] of a trail and Greenway System and a process to progress with that concept, [etc.]" 2008–2010 - Development and advocacy for a "Beach-to-BLM trail".